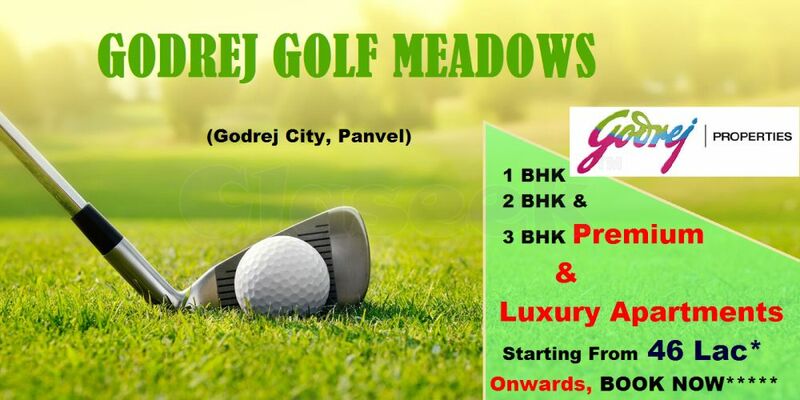 Godrej Properties ready to Launch New Upcoming Project “Godrej Golf Meadows” located at Godrej City, Panvel Mumbai, Maharashtra. Golf Meadows is a Residential Project, offers 1 BHK, 2 BHK, and 3 BHK Premium & Luxurious Residential Flats or Apartments in Panvel Mumbai. Panvel is the most desirable Location in Mumbai. The locality of Golf Meadows Panvel connects one city with another city via Mumbai Pune Expressway. Golf Meadows Mumbai Spread across 3 Acres of Land Area. These 2 & 3 BHK Luxury residential apartments Designed with world-class Amenities i.e Gym, Yoga, Library, Party Hall, Badminton Court, Squash Court, Swimming Pool , Café, Table Tennis Court, Spa, Basketball court, Kids play area, Hospitals, Retail shops , ATMs, Gardens, Shopping Plaza, Safety & Security system, School, Mini theatre which provide a luxurious living lifestyle.